Most people are not aware of the dangers they face of suffering an eye injury from a workplace accident. However, eye injuries that can damage vision or cause blindness are common. According to the National Institute for Occupational Safety and Health (NIOSH), about 2,000 workers suffer an eye injury that requires medical treatment every day. About one-third of these injuries result in a person visiting the emergency room. It can be devastating to suffer a loss of vision or blindness as a result of an accident at work, and this can impact both your work and your day-to-day life. March is Eye Wellness Month, making it a good time to focus on the dangers of eye injuries you could face and how you and your employer can better protect your eyes. What Are the Causes of Eye Injuries in the Workplace? Impact. Flying objects, like chips, fragments, particles, sand, and dust can pose dangers to a worker’s eyes if they penetrate, strike, or scrape the eye. Workers who perform tasks like grinding, chipping, masonry work, drilling, chiseling, riveting, and sanding are at highest risk. Heat. When workers are exposed to high temperatures, splashes of molten metal, or hot sparks, their eyes can suffer burns. Industries that involve pouring, casting, hot dipping, and furnace operations are common places for these injuries, but other workers, such as firefighters, can also be exposed to high temperatures, sparks, and flames that can damage their eyes. Chemicals. If an employee’s eyes are splashed with chemicals or exposed to toxic vapors, mists, and fumes, he can suffer serious eye damage that is permanent. Welders, factory and industrial workers who work with or are exposed to chemicals, and lab workers who use chemicals are a few employees who are at risk. Many workers also suffer eye injuries when using industrial cleaning products. Dust. Dust can be unavoidable in some jobs that involve sanding, woodworking, and working with other dust-producing materials. Employees who wear contact lenses are especially at risk of suffering eye damage. Optical radiation. Laser work that generates high levels of heat, ultraviolent, infrared, and reflected light radiation puts workers at risk of developing cataracts, retina burns, and permanent blindness. Blood splashes. Workers can develop eye diseases if blood splashes or droplets from coughing or sneezing gets into their eyes. This can cause minor irritations or more serious diseases—sometimes life-threatening like HIV, hepatitis B, and avian influenza. Eye strain. Workers in many professions must stare at computer or tablet screens for long periods of time. This can cause eye strain and more serious injuries, such as computer vision syndrome that can cause blurred vision and headaches. Your employer should provide you with suitable eye protection, such as goggles, face shields, and safety glasses that are designed for your specific duty or hazard. You must do your part and be vigilant about wearing your protective gear. Your employer should conduct a hazard assessment to determine areas of your workplace where there is a risk of eye injury and warn you and co-workers of the danger. Your employer should provide vision testing as part of any routine employee exams. You should also have an eye exam as part of your own health monitoring. 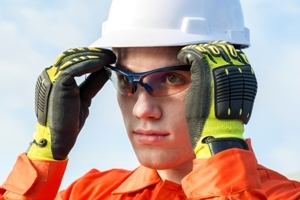 Under OSHA regulations, your employer must provide you with training in any personal protection equipment you use—including eye protection. If your employer does not have a training program, you should ask that it be offered. If you work with hazardous chemicals, your employer should install emergency eye wash stations that comply with OSHA requirements. If you work on a computer regularly, you want to keep your computer about 30 inches away from your eyes. You also should rest your eyes every 15 minutes and remember to blink frequently. Despite your best efforts, you may suffer an eye injury at work and may need to file a claim for workers’ compensation benefits. Manfred Ricciardelli is here to guide you through the steps of filing a claim and fighting for the benefits you deserve. Start an online chat or call our office to schedule your free consultation.